The conflict in Kosovo was profoundly about the claims of Kosovo Albanians for independent statehood, and the opposition thereof, by the Serbian government and local Serbs. 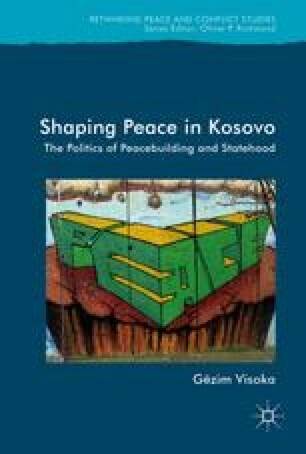 This chapter argues that the international missions referred to “peacebuilding” to appease Kosovo Serbs, as well as “statebuilding” to appease Kosovo Albanians. In managing this complex interplay of forces, the international community deployed multiple fluid forms of intervention varying from extensive and administrative forms of intervention, to more supervisory and diplomatic forms of intervention. While fluid interventionism entailed failure-driven responses to local resistance, it also manifested itself as a by-product of transitional global order and the growing confrontation with dominant powers. Assembly of Kosovo (2008) Kosovo Declaration of Independence, 17 February. Available at http://www.assembly-kosova.org/?cid=2,128,1635 (accessed 20 May 2015). Collaku P (2015) Kosovo Feels the Pressure Over New War Court, 28 December. Available at http://www.balkaninsight.com/en/article/kosovo-feels-the-pressure-over-new-war-court-12-23-2015 (accessed 23 May 2016). D4D (2014a) Ian Cliff on the Tuesday’s Saloon, 23 September. Pristina: Democracy for Development. Available at http://d4d-ks.org/video/ian-cliff-ne-sallonet-e-se-martes/ (accessed 27 December 2015). D4D (2014b) Robert Bosch on the Tuesday’s Saloon, 23 September. Pristina: Democracy for Development. Available at http://d4d-ks.org/video/robert-bosch-ne-sallonet-e-se-martes/ (accessed 28 December 2015). EULEX (2010) Programme Report 2010. Pristina: The EU Rule of Law Mission in Kosovo. Available at http://www.eulex-kosovo.eu/docs/tracking/EULEX%20Programme%20Report%202010%20.pdf (accessed 23 February 2016). Government of Serbia (2007) Address by Prime Minister of Serbia Vojislav Kostunica to the UN Security Council, 03 April. Available at http://reliefweb.int/report/serbia/serbia-rejects-ahtisaaris-proposal-un-security-council-and-requests-new-international (accessed 20 May 2016). Government of Serbia (2008) Decision on the Annulment of the Illegitimate Acts of the Provisional Institutions of Self-government in Kosovo and Metohija on their Declaration of Unilateral Independence, 18 February. Available at http://www.srbija.gov.rs/kosovo-metohija/index.php?id=43159 (accessed 14 February 2016). Newman E and Visoka G (2016) The Foreign Policy of State Recognition: Kosovo’s Diplomatic Strategy to Join International Society. Foreign Policy Analysis. doi: http://dx.doi.org/10.1093/fpa/orw042. Palokaj A (2013) Kosovo-EU Relations: The History of Unfulfilled Aspirations?, Pristina: Kosovo Foundation for Open Society. Available at: http://kfos.org/wp-content/uploads/2013/04/Kosovo-EU-Relations-The-History-of-Unfulfilled-Aspirations.pdf (accessed 28 June 2016). Parliamentary Assembly of the Council of Europe (2010) Inhuman Treatment of People and Illicit Trafficking in Human Organs in Kosovo, AS/Jur 46, 12 December. Available at http://www.assembly.coe.int/CommitteeDocs/2010/ajdoc462010prov.pdf (accessed 20 April 2016). SITF (2014) Statement of the Chief Prosecutor of the Special Investigative Task Force, 29 July, Brussels: Special Investigative Task Force. Available at http://sitf.eu/images/Statement/Statement_of_the_Chief_Prosecutor_of_the_SITF_EN.pdf (accessed 29 December 2015). UN Secretary-General (2007) Secretary-General’s Statement on the New Period of Engagement on Kosovo, 01 August. Available at https://www.un.org/sg/en/content/sg/statement/2007-08-01/secretary-generals-statement-new-period-engagement-kosovo (accessed 20 July 2016). US Department of State (2010) Report of Inspection: Embassy Pristina, Kosovo. Report No. ISP-I-10-38A. Available at https://oig.state.gov/system/files/141666.pdf (accessed 26 February 2016).